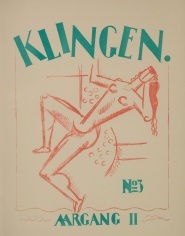 Klingen was a Danish-language avant-garde monthly journal edited by ceramicist Axel Salto, writer Poul Uttenreitter, and from 1918 also author and critic Otto Gelsted. 28 issues were published between 1917-1920 and one issue in 1942. 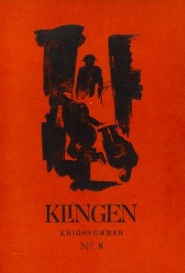 Contributors included Poul Uttenreiter, Tom Kristensen, Emil Bønnelycke, Gabriele Münter, Harald Giersing, Albert Naur, Per Krohg, Vilhelm Lundstrøm. Scans in Blue Mountain Project. "Copenhagen Swordplay. 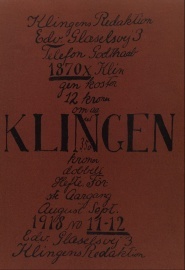 Avant-Garde Manoeuvres and the Aesthetics of War in the Art Magazine Klingen (1917-1920)", in A Cultural History of the Avant-Garde in the Nordic Countries 1900-1925, eds. Tania Ørum, Ping Huang, et al., Amsterdam/New York: Rodopi, 2012, pp 391-400. This page was last modified on 23 March 2017, at 18:29. This page has been accessed 7,252 times.